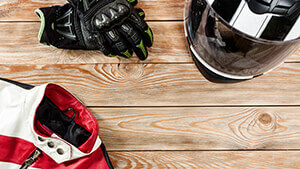 When you are new to riding a motorcycle, the scope of available gear can seem overwhelming to any new rider. From decals and fenders to special lighting and heated handlebars, there are a lot of great gadgets on the market for today’s motorcycle enthusiast. Whether you are just starting out and looking for pointers or you are looking to streamline your gear collection down to the most basic elements, our list of the top 10 motorcycle accessories every rider needs is here to guide you! Helmet: There is no denying that this is one of the most important motorcycle accessories every rider needs. A helmet is the first line of defense against life-threatening injuries resulting in death during an impact or crashes. There are a lot of helmets on the market to choose from in terms of both style and price which also helps eliminate excuses for not having one. The bottom line is you want a helmet that gives ample protection against impacts and doesn’t impede with overall visibility while riding. While many people prefer a full coverage helmet for the added protection it provides to the face, others may prefer an open face helmet for the breathability. Regardless of which one you prefer, make sure your helmet has been thoroughly tested and rated by safety councils in the industry such as Snell or DOT (Department of Transportation) to ensure a safe experience. Jacket: A great riding jacket is an important part of any rider’s gear. When you are traveling at high speeds, whether on the highway or on your off-roading bike, the wind is bound to get to you. With the right jacket made specifically for the needs of riding, you can ride in comfort and with more aerodynamics. A jacket can not only protect you from the wind but also create a barrier between you and the gravel or ground should you fly off the bike. It is important to find a riding jacket for the warmer months and a heavier one for the winter months when you need extra protection from cold winds. Riding boots: One of the often-overlooked motorcycle accessories every rider needs is a great pair of riding boots. While you could just wear whatever footwear you have on hand for your next ride, a pair of boots made specifically for riding is a game changer. When you’re changing gears with a foot pedal, it can quickly lead to scuffs on your favorite shoes or even damage to your feet if you are wearing something flimsy on your feet. Riding boots are made to offer optimal protection from gear changes and accidents, as well as offering better traction and support for your foot while riding. Boots are also sturdy for your foot or ankle if you are thrown from the bike or have a crash. If you are not interested in a pair of riding boots, there are also shoe protectors on the market which are essentially a strap you put over your regular shoes while riding. Gloves: When it comes to protecting your hands, you need a pair of gloves for riding. Gloves can give you a better grip while riding and also protect your hands against damage in the event of an accident or discomfort during colder months. Make sure you choose gloves designed with riding in mind with features such as a retention strap, full functionality in the fingers, padded knuckles for added protection, and palm grips. Phone bike mount: We all know texting and driving causes accidents. When you are on a bike, it is even more serious and potentially life-endangering to answer the phone. With a phone mount on your bike, you can see your GPS, see notifications, and more all while making sure your phone is somewhere safe and not sliding out of your back pocket while you ride. A phone mount is one of the most essential and practical accessories to add to your bike. Goggles/eyewear: One of the more important motorcycle accessories every rider needs is a pair of riding goggles or at the very least a pair of reliable sunglasses. When you are riding, your eyes are exposed to dirt, debris, wind, and rain. If you ride with a full coverage helmet, this is less of an issue, but for those wearing an open face helmet, you need a reliable pair of goggles to keep your eyes protected while riding. Many goggles even offer sun protection for added benefit. Saddlebags: When you are out for a ride, having somewhere to store your stuff is important. Unlike a car, a motorcycle is limited on available storage space for holding the essentials of life. From wallets and house keys to a change of clothes or your stuff for work, saddlebags are a reliable way to hold it all as you make your way down the road. Small tool kit and battery charger/jumper cables: Being stranded on the side of the road or out in the woods on your off-road bike is no fun. That’s why no list of top motorcycle accessories would be complete without a few essentials to get your bike fixed in a hurry. You need to carry with you a few basics such as screwdrivers, wrenches, and other small tools that fit the needs of your bike, as well as jumper cables, and a battery charger. You should also have a tire repair kit on hand in case you end up with a flat tire so you can at least make it back to civilization. First aid kit: A first aid kit is often overlooked as a must-have until you really need one on your bike. A small first aid kit can house important things like bandages, gauze, and other items to help take care of any minor injuries while you are out riding. It is definitely one of those better safe than sorry items you need on your motorcycle. Cover: When it comes to the easiest way to protect your ride for years of enjoyment, a cover is the best bet. Whether your bike is a cruiser, touring model, or off-road beast, you need a cover to protect it from taking on any damages when you aren’t riding.